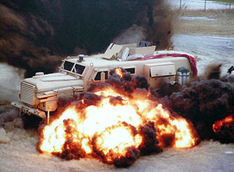 Under-wheel and under-body blasts are the most prevalent effective weapons used against Mine Resistant Ambush Protected (MRAP) vehicles in the current conflicts. During blast events, high accelerations of crew members’ lower extremities, which are in contact with the floor, result in many disabling injuries. Floor mats, which reduce the compressive and bending forces on the lower leg, have demonstrated the ability to reduce injury of crew in combat. US Youth Sports Blast Mitigating Floor Mats are a cost effective solution to reduce the disabling injuries of crew members resulting from floor accelerations during IED and land mine blast events.